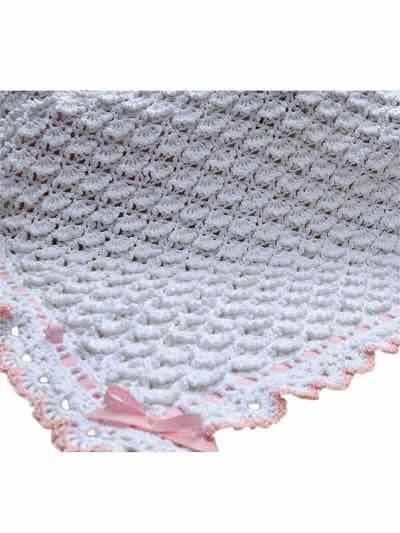 A crocheted baby blanket pattern perfect for your special little one! The shell stitch design in this beautiful crocheted baby blanket pattern come together to create billows of heavenly softness reminiscent of a big puffy cloud. This body of this easy crochet pattern is stitched using DK weight yarn,and the edging uses a fine weight yarn. The finished size is 33” x 33”. Available as a PDF download only. I don't know why this is classified at an easy skill level. I would classify it intermediate. The pattern is a four row repeat consisting of chains, double crochets, back post double crochets, and picots. These are combined to make shells and V stitches. The border adds single crochets to the stitch list. The directions call for using a size C hook for the center panel and a size D hook for the border. You need 1,475 yards of baby weight yarn for the center panel and 178 yards of sport weight yarn for the trim around the outside edge. The texture on this blanket is fantastic. I am making mine in light blue, but in white, it really does look like little clouds! The pattern is extremely well-written and very easy to understand. This one is a real winner.